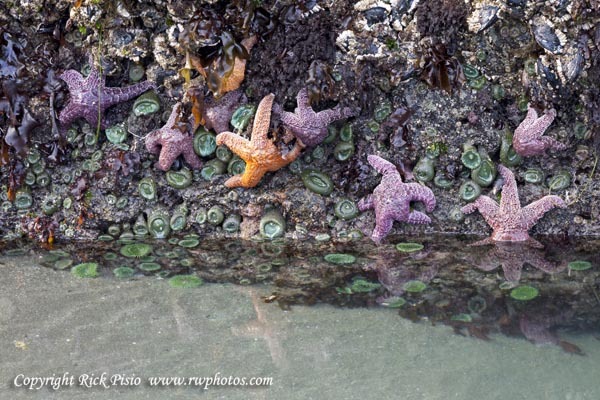 A constellation of starfish and other sea creaturs are reflected in a tidepool at Whaleshead Beach in Southern Oregon. Whaleshead Beach is located 7 miles north of Brookings, Oregon, within Samuel H. Boardman State Park. This entry was posted on Friday, October 4th, 2013 at 5:17 am. It is filed under Animals / Wildlife, New Images and tagged with beach, brookings, clam, coast, constellation, kelp, landscape, low tide, marine life, ocean, Oregon, reflection, seascape, starfish, tide, tide pool, whales head beach, whaleshead beach. You can follow any responses to this entry through the RSS 2.0 feed.